This is the first biography I have ever read, and thanks to the amazing read it was, likely not the last. 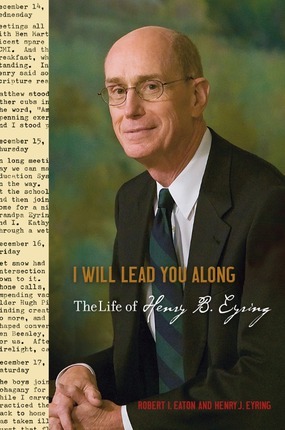 This 560 page inspirational memoir outlines the life of Henry B. Eyring, who is called simply ” Hal” throughout the book. It’s full of sketches form his personal journal, family photographs, quotes from those who know him and typewritten excerpts in Hal’s own words. The multi- media approach to outlining Elder Eyring’s life was not the only draw however. It’s the stories of a man who is ever striving to seek the answers to his prayers, to serve, and to be an amazing father to his children. Hal and his father were both brilliant scientists who left a huge mark on the world around them. I learned so many interesting things about Hal that I didn’t know before. Spencer W. Kimball was Hal’s uncle and often gave him inspirational advice. He owned a red VW beetle from his father as an MBA graduation present. He drove it at Stanford, but it was sold without Hal’s knowledge, by his father-in-law while he was out of town. The replacement car was a late-model Ford Thunderbird with rear “suicide doors” hinged at the back rather than the front. As I carried I Will Lead You Along with me, it drew a lot of attention wherever I went. People often asked to look through it. I highly recommend it because of the example Hal’s life set and the deep lessons that are embedded about seeking the Lord’s guidance in all things and going where he want you to go. An absolutely beautiful and enlightening read. Henry J. Eyring graduated from Brigham Young University, earning a bachelor’s degree in geology and graduate degrees in business administration and law. He is the advancement vice president of BYU-Idaho and has served as director of the BYU MBA program. He also served as president of the Japan Tokyo North Mission. He and his wife, Kelly, are the parents of five children.